It seems like I've been going on a Peruvian binge as of late--during the past year, I've eaten more Peruvian than I'd had in all my 26 years prior. 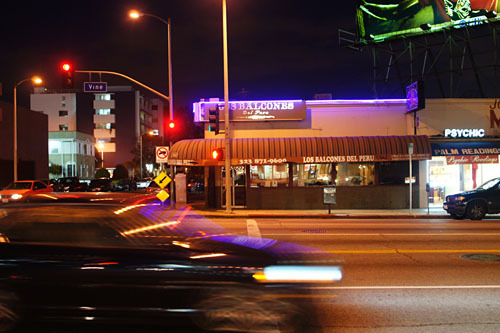 It all started with Mo-Chica, then Mario's Peruvian, and now here I was at Los Balcones del Peru with Andrew and Jenae, two readers whom I'd met previously at La Casita Mexicana. 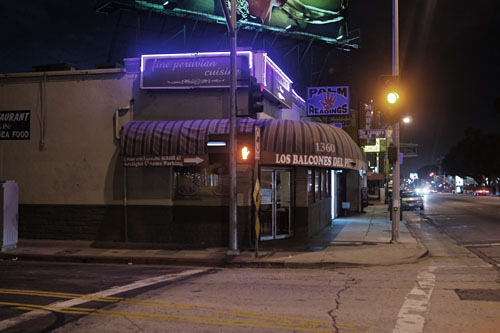 Located nary a mile north of the more well-known original outpost of Mario's Peruvian, Los Balcones del Peru is seemingly named after the numerous balcones of the buildings surrounding Lima's Plaza de Armas, and was famously picked by Jonathan Gold as one of his 99 Essential LA Restaurants. Inside, things are about what you'd expect. Of note are the balcones perched along the walls, doubling as lighting fixtures. Los Balcones' menu has most all of your Peruvian favorites, along with a few interesting items, such as Mr. Gold's beloved camarones a la piedra. 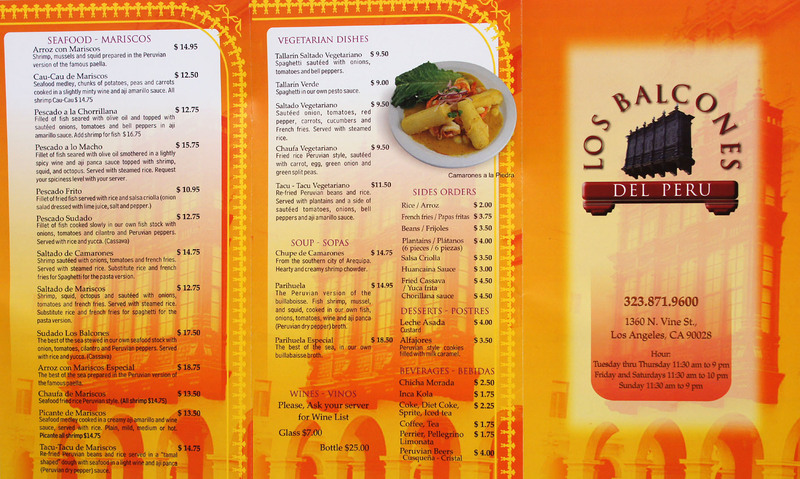 Note that the balcony on the menu's cover appears to be modeled after that of the Archbishop's Palace. Click for larger versions. 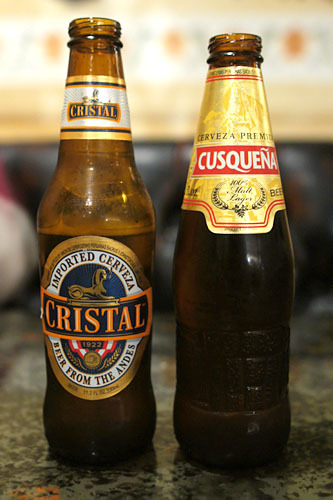 Two Peruvian beers were on offer, both of which I'd had recently at Mario's: Cristal [$4] and Cusqueña [$4]. We asked our server which he preferred, and as was the case at Mario's, Cusqueña was the response. It was a darker, more complex brew, while the Cristal was lighter, brighter, and easier-drinking. We began with the pescado a lo macho, comprised of a olive oil-seared filet of fish in a lightly spicy wine and aji panca (purple chilli pepper) sauce, topped with shrimp, squid, and octopus, and served with steamed rice. We all agreed that the filet, drowning in that sea of tangy, slightly boozy sauce, was the best part of the dish. The other bits of seafood didn't quite live up to the quality of the fish, and the squid was particularly troublesome due to its rubberiness. 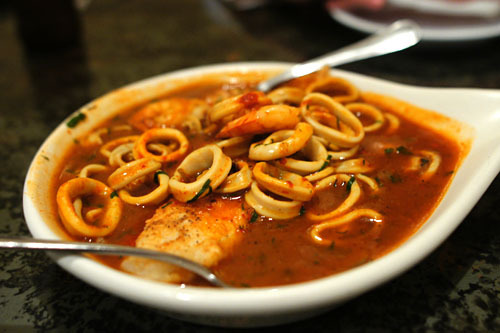 Peruvian cuisine is often noted for its Chinese influence, and this was a great example of such. It looked like your typical Chinese preparation, and indeed, the taste was somewhat reminiscent of such a thing, but there was a beautiful Peruvian twist, an indecipherable wrinkle that really set this dish apart from the rest. Delish. 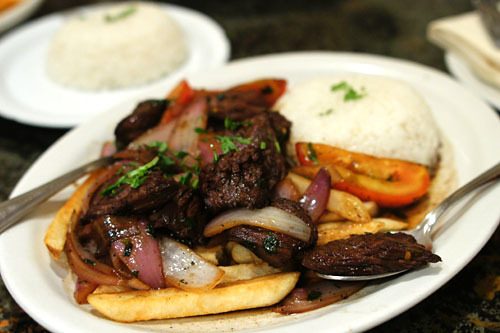 Lomo saltado is sort of the de facto must-order dish at any Peruvian restaurant, but interestingly, that may not be the case here, as Los Balcones is not known for its saltados. Another chifa-influence course, this was simply beef, sautéed with onions, tomatoes, and french fries, served with more steamed rice. 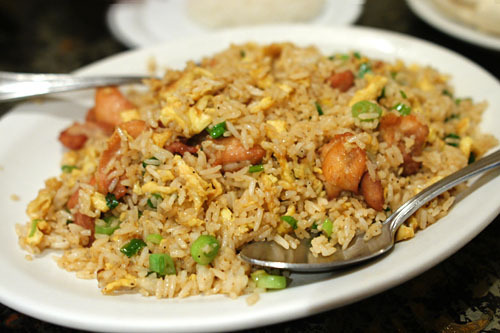 Flavor-wise, the dish was indeed very "Chinese-y," and quite delicious in that regard. The problem was that the beef was overly tough, distracting from the overall eating experience. They saved the best for last. 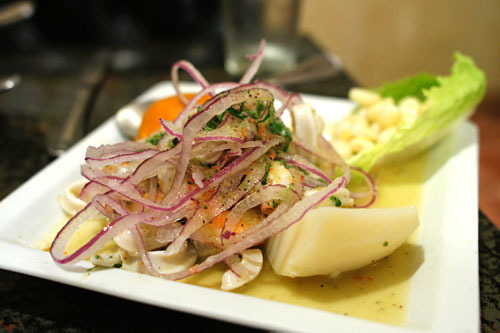 Los Balcones del Peru may not be known for the saltados, but it is known, very much so, for the ceviches. Since this was our first time here, we ordered the mixed variety, composed of fish, shrimp, squid, and octopus, marinated in lime juice and Peruvian spices, served with boiled potato, sweet potato, Peruvian corn (choclo), and red onions. This tart, tangy mélange was easily my favorite course of the night, and quite possibly my favorite ceviche ever. I loved how the zestiness imparted by the acidic marinade played with the various cuts of seafood, while the trio of starches served admirably in tempering the dish. Very nice! Count Los Balcones as another notch in my Peruvian belt. Indeed, the omnipresent lomo saltado was a touch disappointing here, but if you stick to more of the seafood, you'll do just fine. 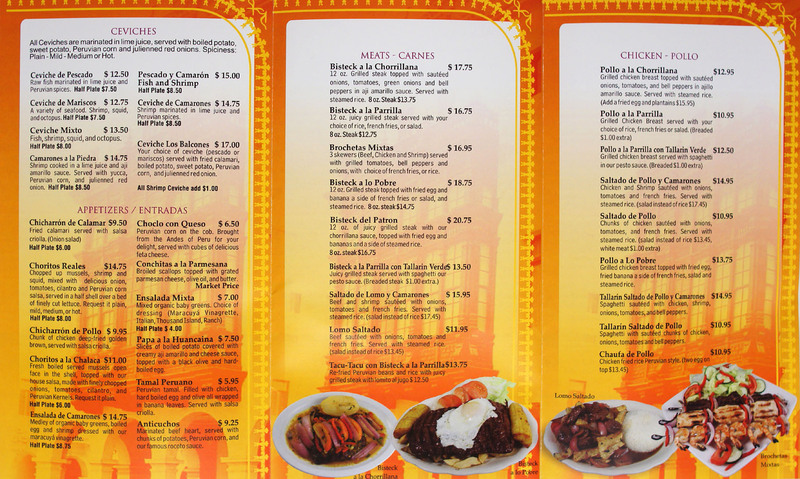 I'd love to return and give the menu a more thorough workout (and maybe even try Gold's camarones)--if only the place weren't so far away! i love the ceviche there! I missed out! I've had a thing for ceviches lately and if this one comes close to being your favorite ever, it must've been good! Hey great pics, what type of camera do you use? Jin: Me too! Which one in particular do you prefer? Anon: For this, I used a Sony a500 DSLR with a Sigma 28mm f1.8 macro lens. 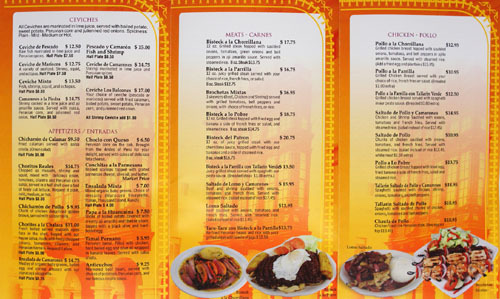 Sounds like the camarones is a must-order next time!